Ever since I was introduced to "denialism" as invented by professional deniers (those who have been paid by vested interests to deny the threats of smoking, asbestos, global warming), I've been reading things with two minds open: my regular old "me" mind as well as a mind that is watching my reactions to what I'm reading. In other words, I'm trying to become more aware of how my worldview makes me believe or disbelieve, welcome or eschew things I read. I so don't want to be guilty of that which miffs me in the amateur global warming denialists and skeptics. Anyway, having said that, I found it fascinating that Brothers Heath support — coming at it from a completely different direction and background — my hypothesis about hope. If you've been here before, you know that one of my mantras is "Hope is not an action verb. Action is our only hope." "When you engineer early successes, what you're really doing is engineering hope. Hope is precious to a change effort. It's ... fuel [for our emotional side]." What they're not saying is that hope leads to action. What they are saying is that action — or, in this case, a celebration of what people have already accomplished, sometimes without even knowing it — leads to hope, which then leads to further action and change. Here's what I would say: "Please, don't ever view wanting to safeguard the future for the children of all species (hells bells, the present for people all over the world!) as demoralizing! Call to action, call to courage! Action is our only hope (and hope is not an action verb)." Or how about "You think these scientific predictions are demoralizing!? Imagine what your children are going to feel like when all this hits them in the face!' How can this be depressing news when it's the most exciting time ever in the history of humankind? When we can, literally with our bare hands on our rooftops and backyards, be part of the greatest transition (away from the Burning Age of Fossil Fuels) and revolution (to the Age of Zero Carbon and Perpetual Energy) our species has ever witnessed! How can anyone find this depressing?" Anyway, on we go. 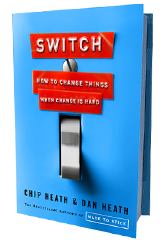 I'm getting some great ideas for change from Switch ... I'm only half way through but I think I would recommend it!